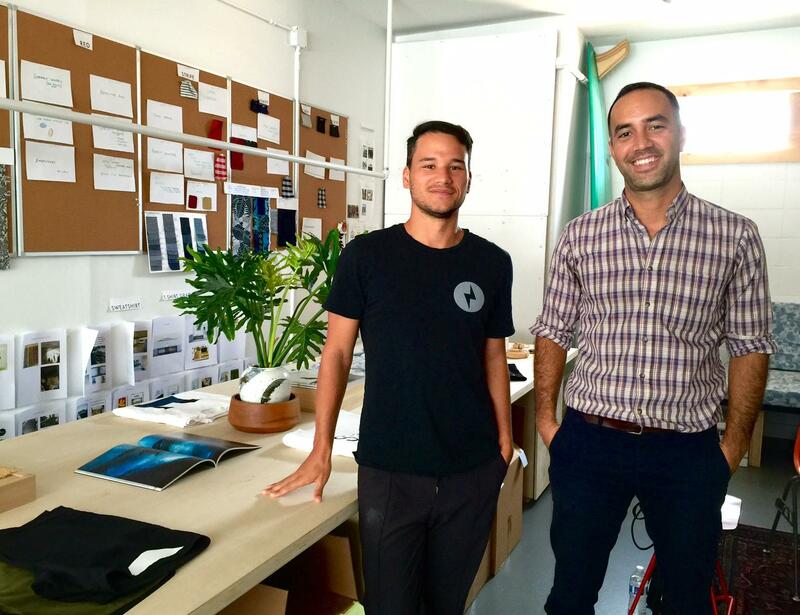 (l-r) Joe Serrao and Napali Souza, co-founders of the menswear brand, Salvage Public, in their Kaimukī studio. 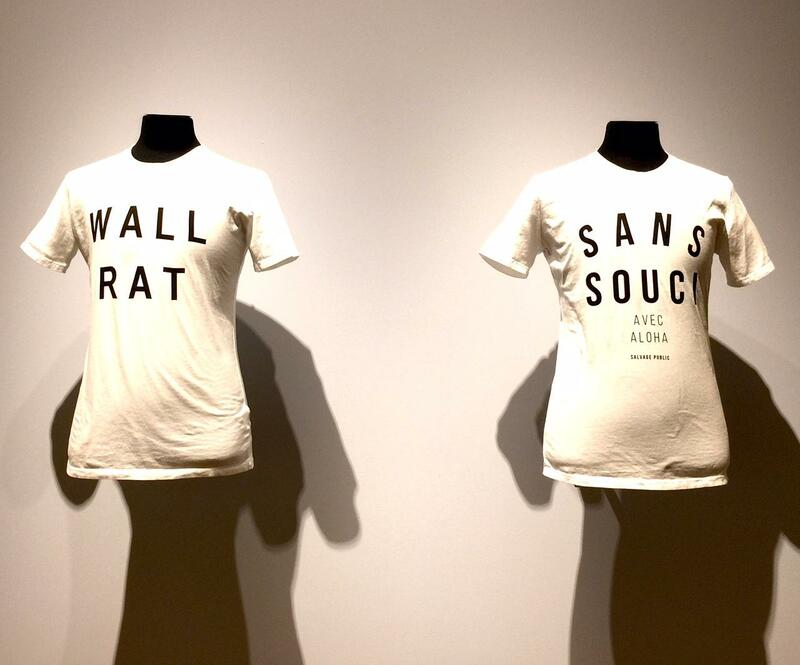 Their t-shirts are among pieces in the “Hawai‘i in Design” exhibition, a survey that includes graphics, surfboards, fashion, and furnishings by contemporary artists at the Honolulu Museum of Art through March 2017. A sampling of current designs, many of which will be featured in Savage Public's new brick and mortar, planned for South Shore Market, Kaka'ako, in late 2016. HPR’s Noe Tanigawa discovered that connection with nature is taking new forms and going deeper as it runs through contemporary local designers. A chat with Honolulu Museum of Arts Curator of the Arts of Hawai'i, Healoha Johnston, and the founders of the menswear line, Salvage Public, about the elements of Hawai'i Style. 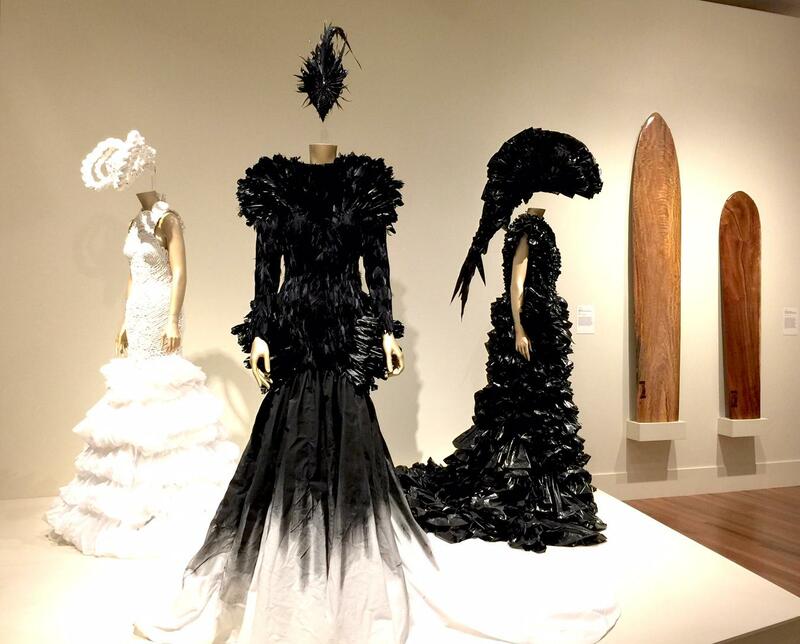 (l-r) "Viper", "Crow", and "Betta", gowns by Koa Johnson, headpieces by Ry-n Shimabuku in “Hawai‘i in Design”. 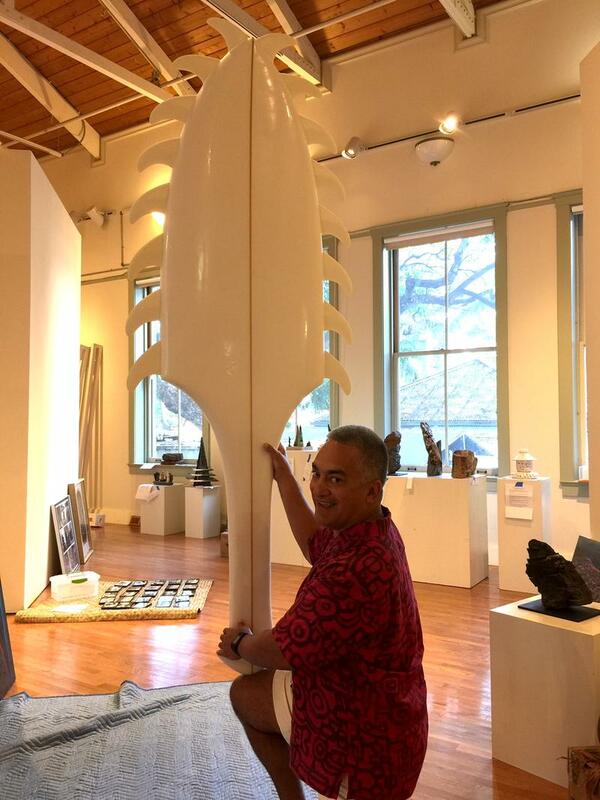 Right, CJ Kanuha, "Kai Popolohua Mea a Kane," koa surfboard. 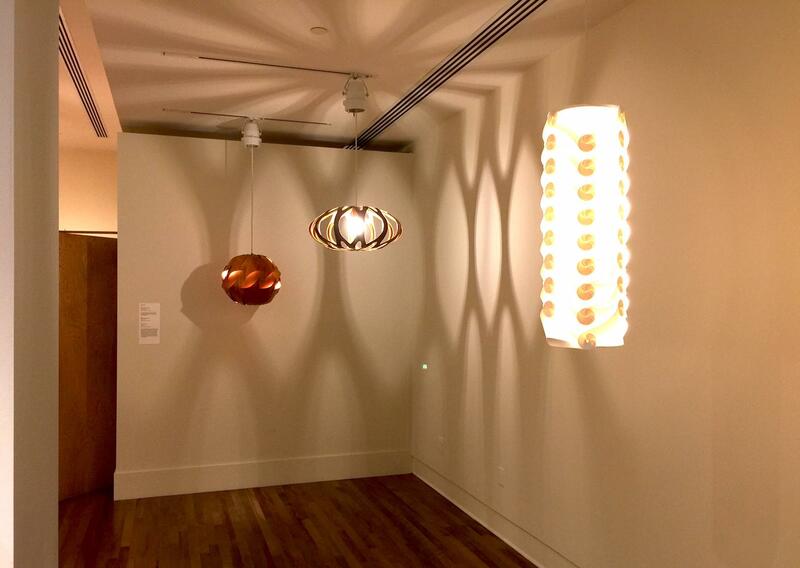 The Hawai‘i in Design show continues at the Honolulu Museum of Art through next March. Salvage Public will open their first retail store soon at South Shore Market in Kaka‘ako. Remember, November is Fashion Month in Hawai‘i, with many more opportunities to view and wear local designers. Souza and Serrao admit getting local guys to do "fashion" is an uphill battle. Men in other countries have long ago abandoned big boxy tees, but here, you'll find mostly sisters and girlfriends springing for the really comfy, body conscious stuff. Why to Serrao and Souza look so good? They reveal their childhood inspirations this extended interview. There's a way people can look that really adds to the occasion. Doesn't have to be fancy, just a little thought, apparently, goes a long way. 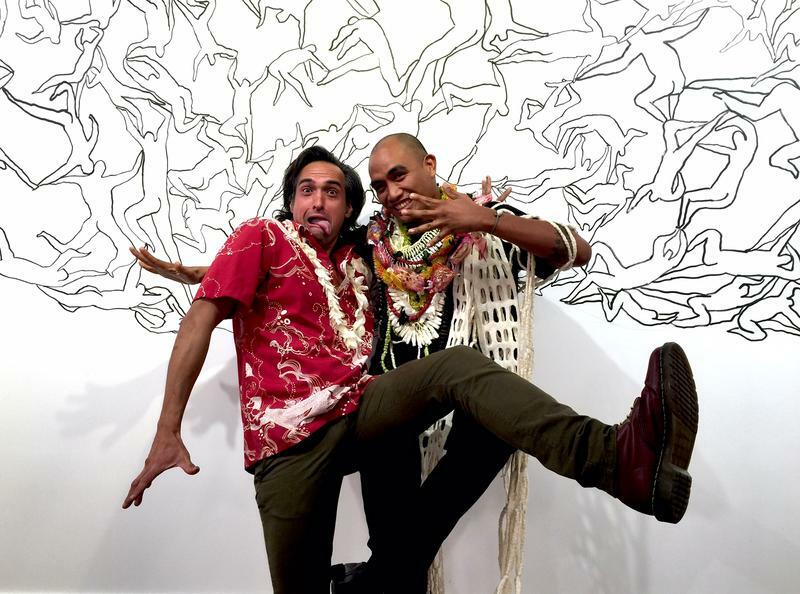 Hear where they got it from Napali Souza and Joe Serrao. Healoha Johnston is curator for the Arts of Hawai‘i at the Honolulu Museum of Art, she curated the Hawai‘i in Design show there now through March 2017. Early ideas for this exhibition were spurred by scholarship by UH Religion professor John Charlot, who wrote about Hawaiian aesthetics as a distillation of the natural environment. How are current designers filtering the natural world and their connection to it? "Not everyone in the exhibition is Hawaiian but all are distilling, responding to Hawai‘i but also projecting Hawai‘i. What they put forth shapes how people view and understand Hawai‘i." 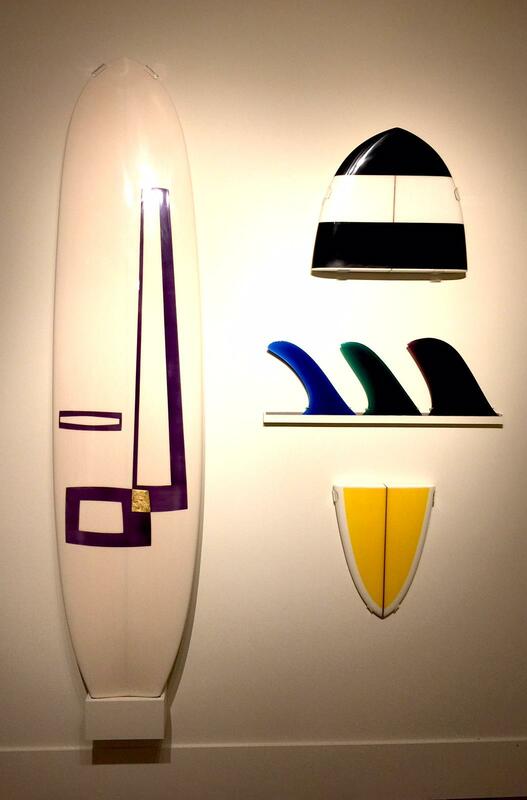 (l-r) "Baby", "Waikiki", "Fins", and "Pipeline", by Eric Walden, polyurethane foam and polyester resin. Mark Chai, Lamps and Light Pods, made from recycled plastic and wood. 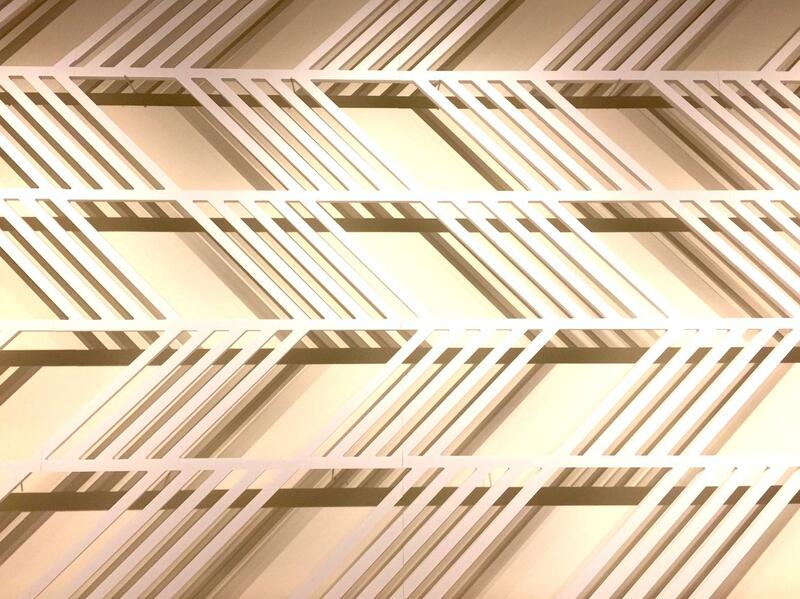 Sig Zane, "Rain From Clear Sky," Gator board, in the "Hawai‘i in Design" show at the Honolulu Museum of Art through March 2017. Editing is a large part of the process at Salvage Public, where co-founder Napali Souza says they stripped down imagery to text, often ‘ōlelo no‘eau, for starters. 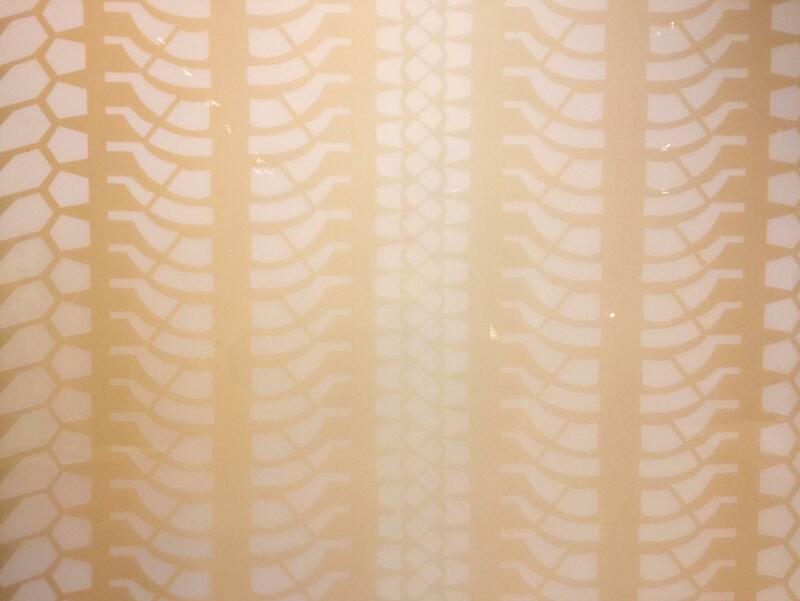 Salvage Public, "Wall Rat" and "San Souci," silkscreen on cotton in HoMA's "Hawai‘i in Design" show. Salvage Public has been around three years now, online only, they’ve already been featured in the New York Times. Along with paring down imagery, co-founder Joe Serrao says they focused first on a nice fit—that was new in the market. Wearers praise the fabric, and the fact that it doesn’t scream tropical. 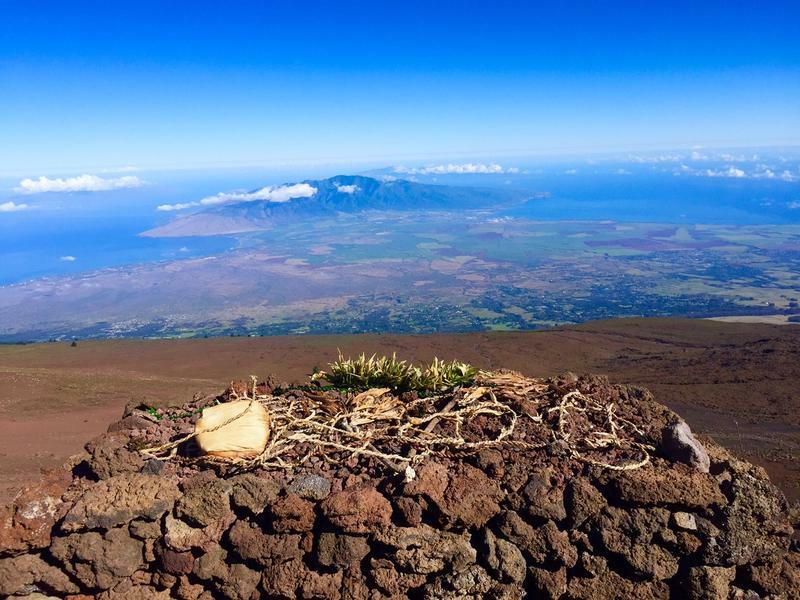 Pieces reference Hawai‘i on a more intimate level—which is where many tourists want to be, actually. What is the Salvage Public guy like? “He’s not trying too hard. At the same time, he looks refined and he looks clean.” Serrao and Souza admit getting local guys to do fashion is an uphill battle, but they’ll be opening their first brick and mortar soon with a full line of aloha shirts, t- shirts, the new board shorts are a little shorter, even jackets. Or at least for Hawai‘i. Salvage Public already uses organic cotton and dyes when possible, they do as much production in Hawai‘i as they can. Making high quality locally takes commitment and money, they say. Price points become the big hurdle, because Souza says people expect even great clothes to be cheap. Keith Tallett, "Mauna Kea Snowchains (Lock Da Hubs) Flying Hawaiian Series, mixed media on panel. November is Hawai‘i Fashion Month, and the goal is to showcase local talent and promote sustainable statewide growth of this industry. Events highlight designers, stylists, manufacturers, retailers, photographers, hair and make-up artists, and much more. 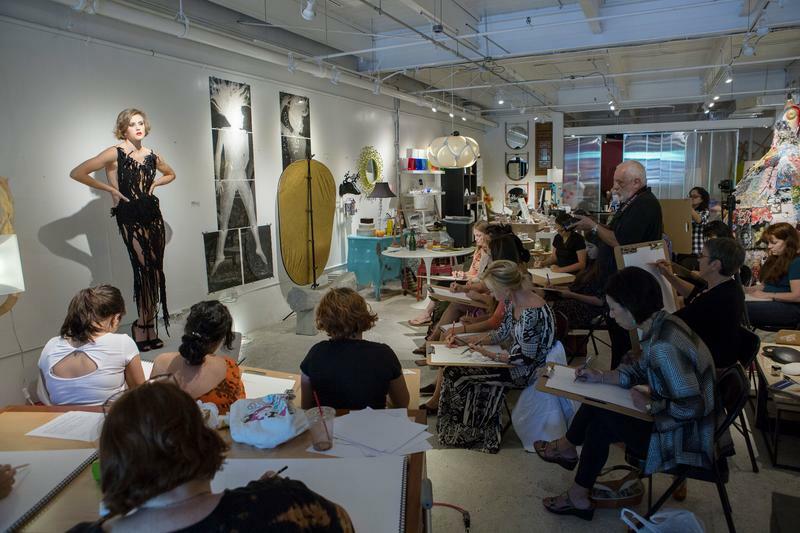 HPR’s Noe Tanigawa reports on an upcoming discussion of the business of fashion.